At Saluja Cosmetic & Laser Center, we carry several products for convenience of our patients that deliver proven results and are cost effective. Dr. Saluja believes there must be scientific evidence to support the efficacy of products she carries while also providing a real value to her patients. The thin periocular tissue (the area under the eye) begins to show aging in the form of crepey skin and poor elastic recoil. One of our favorite topical treatments is EltaMD®Renew Eye Gel to help combat this issue. Why? It is formulated with peptides that improve the microcirculation under the eye to diminish the "puffiness" that occurs from fluid build-up. 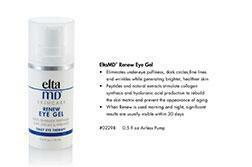 EltaMD® Renew Eye Gel also diminishes the appearance of fine lines and wrinkles by improving the production of hyaluronic acid, collagen, and elastin in the dermis, giving greater support to the skin and visibly smoothening the treated area as early as 30 days post use. It is recommended to use daily in the morning and night. Apply to freshly washed skin. One of the most important anti-aging products that we can use topically is sunscreen! UV rays cause premature wrinkling, pigmentation, and loss of elasticity, in addition to harmful sunburns, which are the predecessors of skin cancer. This is why choosing an effective sunscreen, which is broad spectrum to effectively cover both UVA and UVB rays while being fragrance-and paraben-free so that patients with sensitive skin or rosacea may still be able to benefit, is so important! 1. 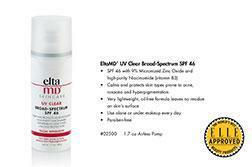 EltaMD® UV Clear is intended more for our acne-prone patients and rosacea patients. This formulation has zinc oxide and octinoxate, while also having 5 percent niacinamide (vitamin B3), which works to minimize discoloration associated with post-inflammatory hyperpigmentation seen with acne and photodamage from the sun. In addition, the sunscreen is noncomedogenic, so will not promote breakouts. 2. 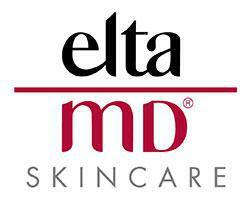 EltaMD® Daily Tinted is a moisturizing sunscreen with zinc oxide and octinoxate to protect the skin from UVA and UVB damage and also has hyaluronic acid intermixed to provide a moisturizing effect. We carry the tinted formulation so that in the morning, this can serve as your moisturizer, your makeup, and, most importantly, your shield from the sun rays. 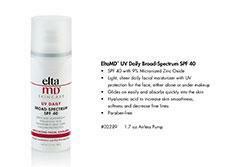 The lightweight feel of the sunscreen has made this both a staff and patient favorite! Eyelashes frame the beauty of our eyes. With time, our lashes diminish in number, length, and diameter. In order to keep lashes looking lush and long, Allergan got it right with the advent of Latisse®. Latisse® (Bimatoprost ophthalmic solution 0.03%), first came to market as Lumigan®, which is still used for glaucoma to diminish intraocular pressure. Glaucoma patients began to notice that their lashes were growing! Allergan then reformulated the drop and received FDA clearance to be used for the lashes. With daily use of Latisse®, lashes begin to grow thicker and more plentiful starting around six weeks post usage, up to 16 weeks. We often recommend buying a very thin lash brush (from a local drugstore) to apply the Latisse® to the upper lid. A small percentage of patients may develop ocular irritation from the product, in which case they should discontinue use. Bimatoprost can also rarely increase the color of hazel eyes. While this is extremely rare and even rarer since Latisse® is used on the outer aspect of the eye, it is important to know. Lashes return to their previous appearance when the product is discontinued. Beginning in our mid 20s to early 30s, our skin loses 2% of the natural elastin and collagen annually. Overtime, this gives the visible appearance of fine lines and wrinkles, which become more significant with time. One of the most important aspects of skincare is to wear sunscreen daily to protect against photodamage. In order to help the fine lines and wrinkles and to improve skin tone and texture, we recommend TNS Recovery Complex®. What is TNS Recovery Complex®? It is a rejuvenating serum created by Allergan (the makers of BOTOX®, Juvéderm®, and Latisse®), which incorporates growth factors into the product as messenger proteins that work in the dermis to direct your skin to stimulate collagen and elastin to improve the tone and elasticity of the skin, which correlates into a healthier skin matrix. Each bottle of TNS Recovery Complex® takes eight weeks to make and incorporates a blend of 110 growth factors! It is great for the face and décolletage area, and there are more than 27 clinical studies published that validate the safety and efficacy of this product! It is an important adjunct to laser treatment, and I recommend it for our patients.